This tree at 8935 Careytown Road was one of several knocked down in the area during a late afternoon storm Thursday. A repairman works on damage Friday at the Meredith Chaney home on Careytown Road. Chaney had already cleared most of the debris from a Thursday storm away his yard by noon Friday. There was heavy storm damage along Careytown Road and elsewhere in Highland County, and power was knocked out to more than a thousand Hillsboro area AEP customers Thursday. But the National Weather Service said Friday afternoon that it had heard nothing, until it was contacted by The Times-Gazette, of any damage in Highland County. Along Careytown Road massive trees were snapped in half, others were uprooted, and there was damage to several structures. Some said parts of bean fields were laid down in unusual patterns. Victoria Peters said she was in her kitchen at at 8935 Careytown Road when she heard one side of a massive tree break off from the trunk. “I looked out my window, and oh my God, stuff was hitting three sides of the house simultaneously. That’s when I ran to the basement,” Peters said. That first tree fell less that 20 yards from the right side of her home, and another large tree in front of the home split in half and fell forward away from the home. There was damage to other trees on the property. Peters said she was planning to host a gathering of about 50 people Saturday. “I called and told everyone we’re still having it. I told them to come early, and bring a chainsaw,” she laughed. A local insurance agent was at the Nick Lindsey home on Careytown Road where several cedar trees were snapped in half and there was damage to a barn. The insurance agent said the roof on the front porch of the residence had been lifted partially off its supports and then set back down by winds of some kind during the storm. The Meredith and Janet Chaney home at 8796 Careytown Road had two large trees snapped off in front of the residence, and several more trees downed elsewhere on the property. Two trees in the yard knocked down a utility pole and knocked out power to the home. The Chaneys said the storm lifted a swing off their front porch and threw it out in their yard. It also scattered mail from a mailbox all over the yard, and caused some minor damage to their home. They were not home when the storm struck. Others in the area said there was extensive damage on Grabill Road. Highland County Engineer Dean Otworth said trees were also down across roadways on Dade, Kibler and Panhandle roads. He said his crews temporarily put up barricades on Careytown Road because an electric line was down on the road. He said the storm struck around 4:30 p.m. and that crews had the roads cleared by 7:30 p.m.
A spokesperson for AEP said about 1,300 Hillsboro customers were without power Thursday evening due to a lightning strike. He said the strike took place somewhere in the areas of High Street and Dunlap Road, but he did not know what the lightning struck. Power went off at 4:54 p.m. and was restored at 7:51 p.m., the spokesperson said. 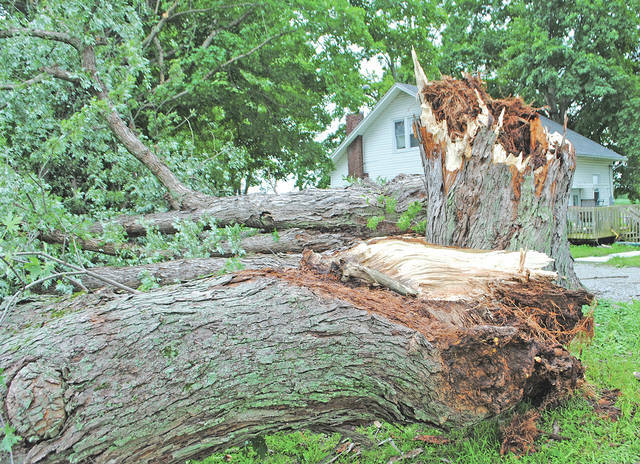 https://www.timesgazette.com/wp-content/uploads/sites/33/2018/07/web1_Storm-pic-1.jpgThis tree at 8935 Careytown Road was one of several knocked down in the area during a late afternoon storm Thursday. https://www.timesgazette.com/wp-content/uploads/sites/33/2018/07/web1_Storm-pic-2.jpgA repairman works on damage Friday at the Meredith Chaney home on Careytown Road. 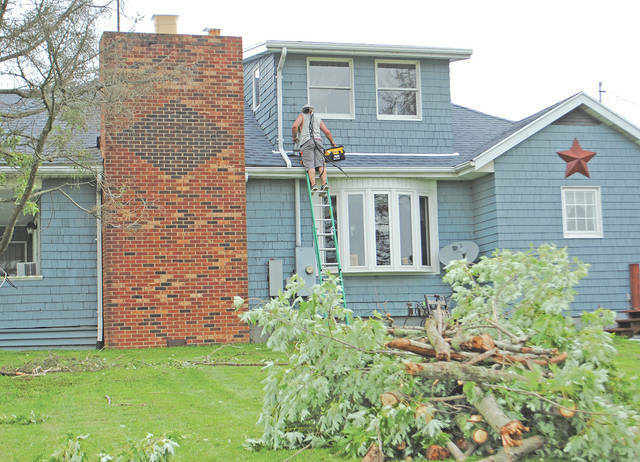 Chaney had already cleared most of the debris from a Thursday storm away his yard by noon Friday.